When Holy Church stresses to Will that “treuthe” is the best of all treasures and a glorious love-gift from God, Will resists her counsel. Instead of relying upon faith, he insists on employing his mind to discern truth’s meaning, which he finds in the concrete objects of this world. The certain knowledge that these objects provide stands apart from the kind of knowledge described by Holy Church. This gap explains the inherent difficulty for Will in completing his search for divine truth, for the mind can never know the essence of metaphysical matters. Yet his search does not simply educe the limitations of our cognitive abilities; more importantly, it reveals a specific epistemological pattern that conjoins Scotist and Ockhamist conceptions of thought—namely, intuitive and abstractive cognition. Logically, this pattern helps to explicate the counsel proffered to Will in the Vita de Dowel, a section that focuses exclusively upon human mental faculties. 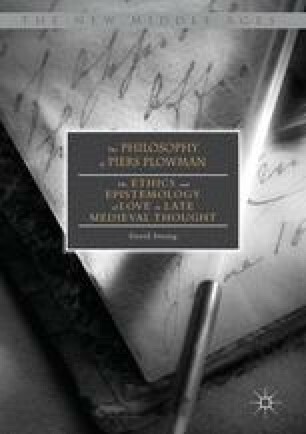 This chapter thus examines three select episodes from the Vita to illustrate how an awareness of these thinkers helps us to better understand the epistemological theories central to the poem’s narrative and, in turn, champion Will’s inquiries into the mind’s powers.